A Tieguanyin Wang King grade with exquisite perfume that defies the imagination. In the ancient Buddhist cosmology, the universe is divided into six realms. The human sits in the middle, they experience both happiness and suffering in some measures. The gods and demigods occupy the two higher realms. They live for millions of years, and enjoy all things they desire with ease and abundance - until their fall from grace. If the Jipin grade is the existence of a dignified human being, then the King grade is the god realm. Can you imagine yourself breathing in the heavenly aroma? Compared to the Jipin grade, the King Grades do give you a real step change in quality. 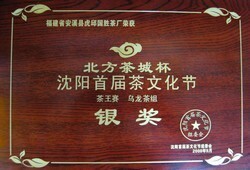 The deserved successor to the King Grade 1 of 2009 (who was the Gold medal winner of the Shenyang Tea Exposition Fair of October 2008), King Grade 1 has an exquisite osmanthus perfume. While after-feeling is the most neglected of the tea journey, the Chinese expert regards it as the most important determinant of quality. A high quality tea should make a difference to your day, making you feel refreshed and alert! 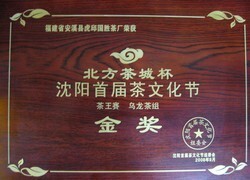 Successor to the King Grade 2 of 2009 (who was the Silver medal winner of the Shenyang Tea Exposition Fair of October 2008)，King Grade 2 is similar to 1, but more oxidized. The perfume is orchid. Being more oxidized gives her a stronger aroma and taste, yet retaining an elegance that makes her very well rounded and harmonious. You may also be surprised to find her aroma peaks later, after 3 infusions. King Grade 3 is also similar to 1 and 2, with lighter taste and orchid aroma. She is notable for her wet leaves, which are extremely attractive. King Grade 4 is also orchid with lighter taste and aroma. She is notable for her attractive wet leaves and exquisitely sweet taste! King 5 is also orchid. She is notable for her heavier mouthfeel and long stamina. You can infuse her for many times, and yet the flavors will stay and not diminish! The Moli Fengyan is fine, as always! (Though I personally don't drink it often, it is my wife's cup of tea). The Tieguanyin Wang is excellent, particularly no. 1 (I have only tasted no. 1 and 5 till now). Rating 5! Very light and smooth taste. I have tried quite a few and this is a very pleasant blend. It hold itself very well through multiple steeping at 190º. I would definitely purchase again. Beautiful tea. One to drink any time of the day. I just love these teas and highly recommend them to anyone who loves a good cup of tea, or someone just trying them out. 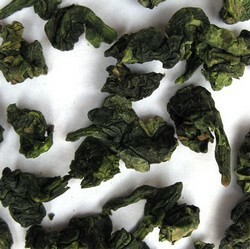 The Tieguanyin Wang (King 2) is AWESOME! I shared it with my girlfriend and she will be placing an order of King 1, 2, & 5 any time now. I will rate it 5+, and more!